So I thought it would be cool to do the first K-on artwork. (I was going to do the same with Clannad way back when but never got around to it.) I think I'll like this series since a) it's KyoAni, b) the art and animation is nice and c) the premise sounds interesting enough. The vector was mostly easy and fun, just the guitar is worth mentioning. I stroked it! And stroked it again and stroked it again! Muahaha! [/laziness] But I think I got the stroked part to fit in alright with the rest of the vector. Colouring it was also something...I wasn't really sure how to go about recreating the design on it 0_0 But I did it. It's not perfect! But it's done. There was something written on the top of her guitar but I couldn't make it out so I just wrote her name. Yes, I believe this is Yui Hirasawa (if it's not I have some things to change XD) and she apparently plays a "Honey Burst Gibson Les Paul Standard electric guitar" which is where the title came from. My second time vectoring a guitar. This one was harder. I was like "oh, I want to do a nice quick vector..." Pffft. 16 hours. Great job on the lines and guitar, and getting that smooth look out. Some scans are that way, it's not her fault. submit more vectors >D so i can steal them and make wonderful pngs! 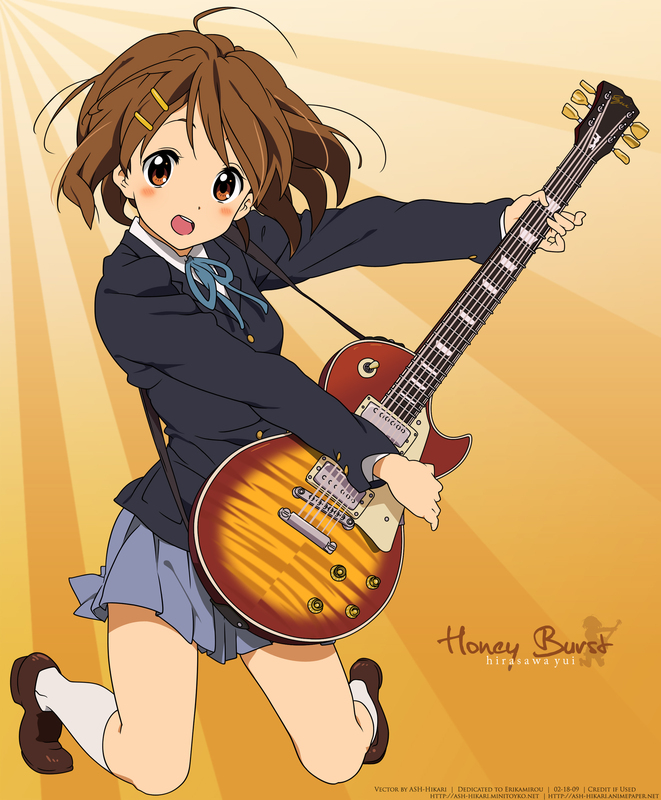 Awesome vector, might have to do one myself hehe I noticed one thing though on your very impressive guitar, the 6th string on the bottom is below the fret board partially and it seems to merge with the pin striping and doesn't reach the neck. Not even sure it requires fixing cause the vector still looks awesome and it doesn't really detract from it. the anime surely good. i like to watch it later. need to comment this later if I ever have the time. I'm not used to your lines being that way XD not that they look bad, they actually look very clean. the guitar is awesome. love the pattern! I Love yhis vector! Thanks for share! awesome art, btw she plays a Gibson 2008 Standard Heritage Cherry Sunburst Les Paul.